OXFORD, Miss. 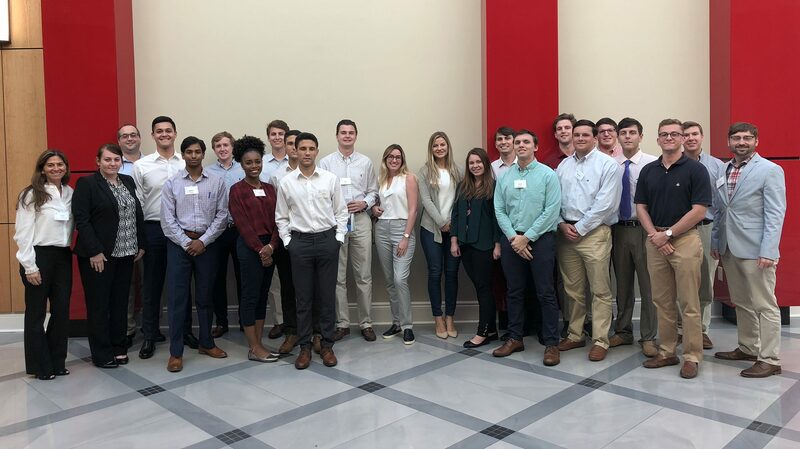 – Dozens of business students at the University of Mississippi got career advice, interview tips and a crash course in the direction of the financial industry from professionals in the field at the recent Investment Banking Workshop, hosted by the School of Business Administration. The two-day event connected students with professionals, who offered advice on how to prepare to land that first job and pointers on how to succeed in the workforce. “Thanks to the generous donation of one of our sponsors, the Mississippi CFA Society, seven Tupelo students had the privilege of attending the investment banking workshop,” said Ivonne Liebenberg, instructional assistant professor of finance. The event kicked off with a panel discussion and Q&A session with Charles White, executive managing director of Stifel Financial Capital Markets; Britton Wilkins, senior vice president of Vining-Sparks IBG LP; and Sam Haskell, managing member of Colarian LLC. “You just need to get your foot in the door,” White said. “Once you are in, that is where the opportunities come up. I wish I would have known that this is a very long race. During the Q&A session, a student asked Haskell about the qualities he looks for in an analyst. The workshop included investment banking interview prep sessions where Jeff Schmidt, a financial analyst with extensive industry experience at Tudor, Pickering, Holt & Co. and Raymond James Financial, reviewed basic accounting and helped prepare students for potential interviews. This was an opportunity for students to consider challenging interview questions and formulate responses. Students gave the workshop high marks. “The University of Mississippi offers a variety of beneficial resources on and off campus, but what I experienced at the Wall Street Prep Investment Banking session was leaps and bounds above anything I have participated in thus far as a student,” said Cam Iadeluca, a senior accounting major from North Kingstown, Rhode Island. The workshop, conducted Oct. 4-5, succeeded in helping students bridge the gap between classroom theory and real-world practice, said Andrew Lynch, assistant professor of finance. “We had 44 students come out to learn how to start a career from several incredibly successful finance professionals,” Lynch said. “The goal was to ensure these students start building their careers on as solid of a foundation as possible.